The Panasonic KXT7636 Phone is only compatible with the Panasonic Telephone systems, and is not suitable for home use. 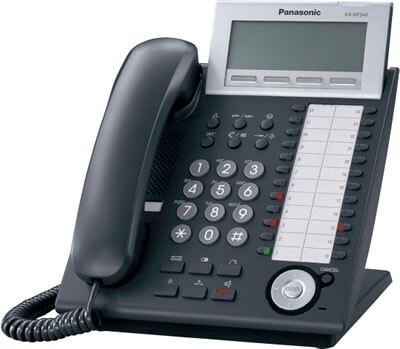 The Panasonic KX-NT346 IP system phone is compatible with the Panasonic KXTDE telephone system. As it is an IP system phone it needs to be connected to a LAN and allocated an IP address to work. If it is plugged into a standard extension or telephone line then the phone will not function. There are 24 programmable keys that can be set to do specific things as the user requires. Instead of pressing multiple buttons to do the same thing, pressing the one programmed key would do. The buttons have dual colour LED lights so the user can tell if something is in use already. For example if another extension on the Panasonic KXTDE system was in use the button on the Panasonic KX-NT346 IP system telephone would light up indicating it was.